Do you have a little master chef at home? 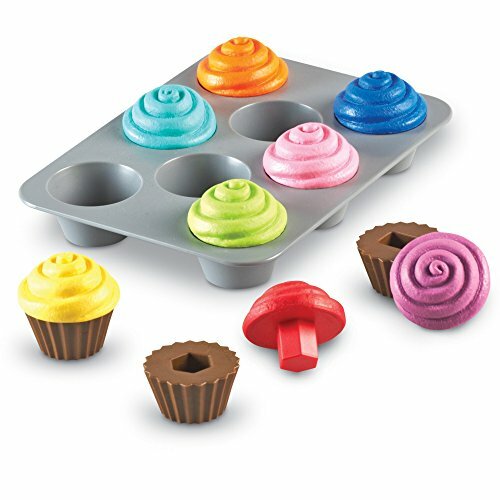 Play foods are definitely one of the most popular toys around, for boys and girls, and we’ve found some of the best play food toys out there. You’re sure to find something for your child — whether it’s sweet or savory. Children love pretending to cook, grill, or even wash the dishes, like mom and dad. In fact, this is often the first imaginative play parents see from their children. 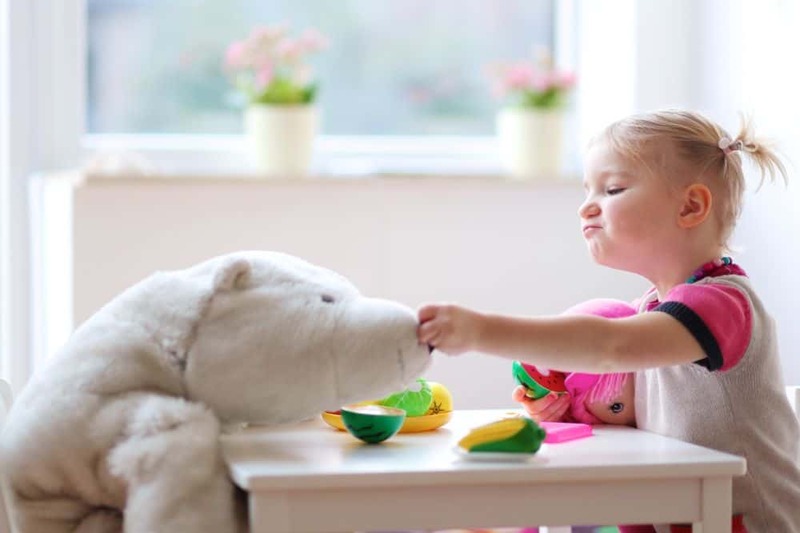 Play food toys are a great way for your child to learn about different types of foods. Use the links above to check the latest prices or read our in-depth play food toy reviews below. As you’re making a grocery list of imaginary toys for your child, you may wonder what you should buy. How can you choose the best from such a wide range of products? To help you out a little, we’ve created a short guide on how to go about it. If a child loves a toy, it will be played with a lot. It might be taken to kindergarten or become the must-have for bedtime. If your child is as obsessive as mine, they need something that will last. With food toys, there are usually two choices if you want the best quality: wood or hard plastic. These materials are made to last through rough play, hard hits, and the occasional drool. As parents, we often get caught up in how we feel about certain toys. With that, I mean we sometimes go for what we think looks fun and cute. Although we do this with the best of intentions, it might not always be the best option for our kids. Babies: At this age, it’s all about toys that are safe to be chewed on. Teething babies will most likely go for a bite. Babies also enjoy large and colorful toys. Toddlers and preschoolers: You’ll start to see lots of imaginative play. Some might even enjoy food items that come in pieces, so they can “cut” them. Older kids: Forget the pink carrots, older children will enjoy toys that resemble the real thing as much as possible. Think shopping scenarios and other food-related themes they experience regularly. When choosing play food toys, it’s crucial to remember that these toys will most likely be “eaten,” so it’s vital to choose non-toxic toys. Those that contain toxins, like lead, BPA, and phthalates should be avoided (source). To keep your children safe, look for toys without sharp or pointed edges. If it’s made of wood, make sure the surface is smooth to avoid splinters. With such a huge choice available on the market, it can be difficult to know which to buy. Hopefully, our quick guide will point you in the right direction. Keep reading to see our list of the best play food toys. 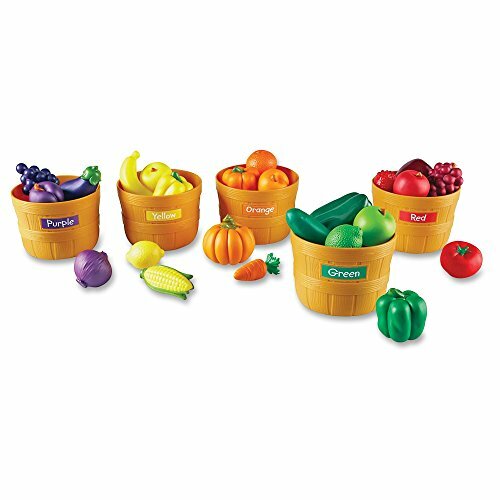 This colorful set includes five plastic baskets, each marked with a colored sticker label. 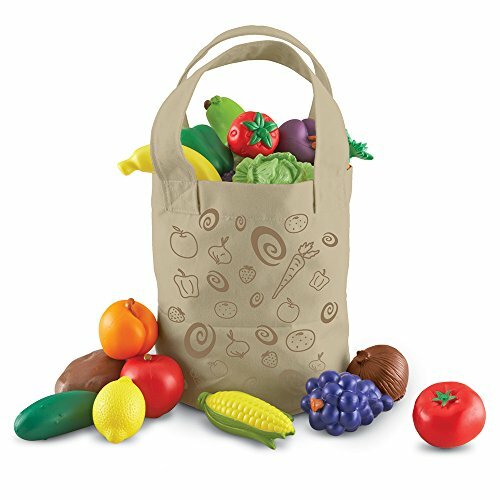 The set also comes with 25 pieces of realistic-looking fruits and veggies that your 3-year-old can organize by color scheme. Watch your child turn the living room into a farmer’s market while working on their vocabulary and healthy eating habits. With options such as eggplant and pumpkin, this set can help you introduce lesser-known produce items to your kid. An activity guide is included. 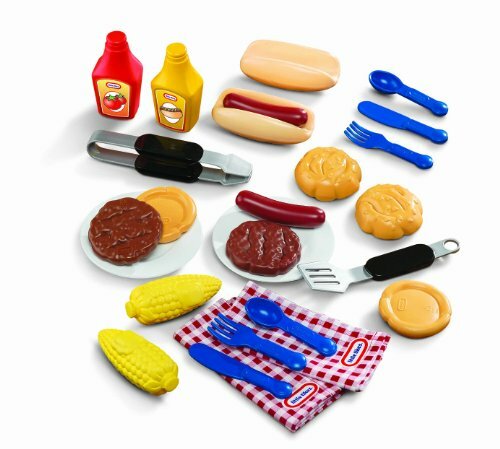 Your kid will be grilling up a storm with this BBQ set, to complement any Little Tikes grill. It features 20 pieces, including those charming checkered napkins, found at most BBQ sites across the country. A spatula and tongs will help them imitate dad at the grill. There are burgers, hot dogs, corn, and condiments. Plates and utensils suitable for a two-person dinner are also included. Ideal for children aged 3 and up. 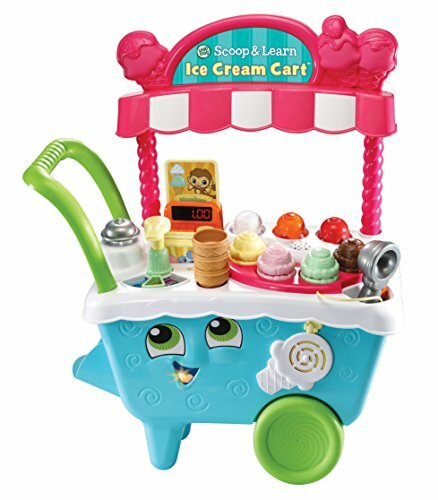 This ice-cream cart could be your toddler’s new favorite toy. The set includes a cart, toppings, ice creams, a scooper, and cones. One of the best parts about this cart is that it’s educational, with a counting feature and six activity cards included. Thanks to the big wheels, your 2-year-old can easily push the cart around the house or yard, in true ice-cream cart style, with sounds and music. 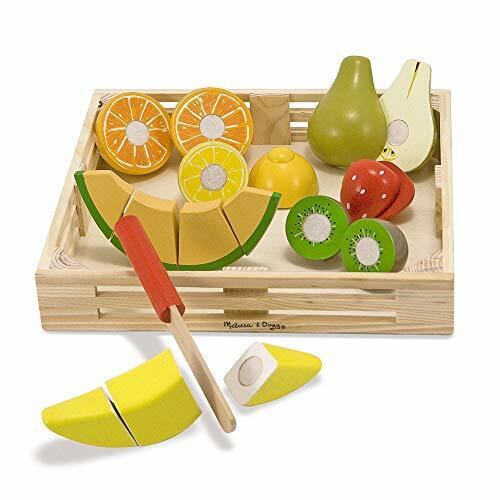 Let your child prepare you a delicious fruit platter with this cute set. It features seven kinds of fruits, including strawberry, orange, lemon, and melon. The fruits look so realistic and will be a delight for 3-year-olds, and older children as well. Your child can use the wooden knife to “cut” the fruits into pieces as they learn the concept of a quarter, half, and whole, for example. It’s a good time to introduce the basics of knife safety as well. All items are made of high-quality wood, and when playtime ends, there’s a crate to store all the fruits in. 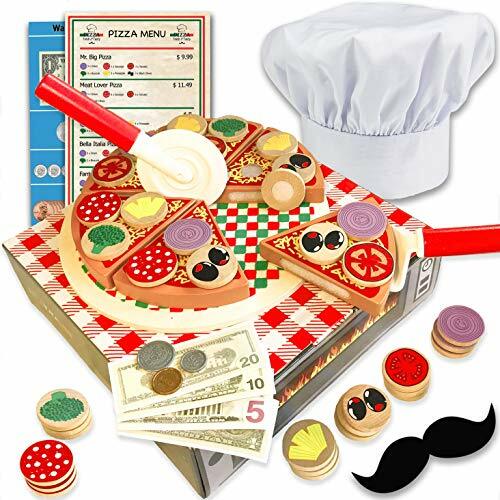 If your child loves pizza, they’re sure to love this themed set. Here, they get to create their own, using different toppings, such as olives and salami. The toppings attach to the pizza with velcro, so they won’t be sliding off when the pizza goes in the cardboard oven. Comes complete with a chef’s hat, six mustaches, and a menu for ordering. The set also comes with a drawer of coins and bills for check time, to make the play even more realistic. The whole shebang is ready for your young pizza maker, 3 years and up. If you’re on the lookout for a large set that includes all the items your child might need, this could be it. 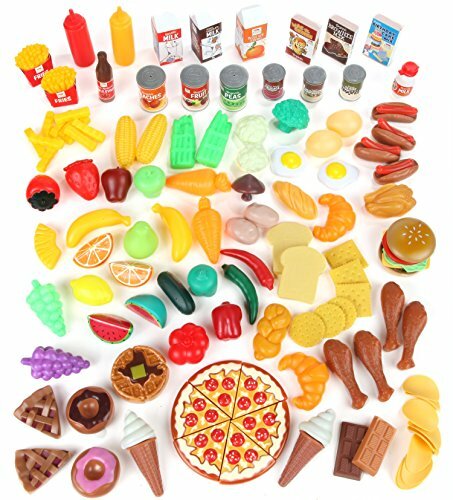 This humongous set has 125 pieces, everything from breakfast treats to pizza, canned foods, fruits, and more. Everything is made of durable BPA-free plastic. The set is suitable for children aged 3 and up. Given the variety, these items can be transferred over to a play kitchen set once your kid is ready. Great fun for sharing, too, with plenty for everyone. Your 2-year-old may not be the biggest fan of fruits and veggies. However, that might change with the help of this fun set. They’ll get to play around with 16 pieces, including grapes, tomatoes, and onions. All items are made of a crush-resistant, rubber-like plastic. Because of the soft material, the pieces are comfortable and easy to hold and play with. The included tote is made of durable canvas to suit your child’s needs for their upcoming shopping trips. This could be your chance to instill a sense of responsibility around single-use plastics. These colorful cupcakes not only look mouthwatering, they’re also educational. Each cupcake top comes with a unique shape on the underside, which has to match the appropriate bottom piece. This set is suitable for children aged 18 months and up. This type of sorting game is great for young toddlers. It not only teaches them various shapes, but it also helps to develop their fine motor skills. The set comes with eight cupcakes and a pan. 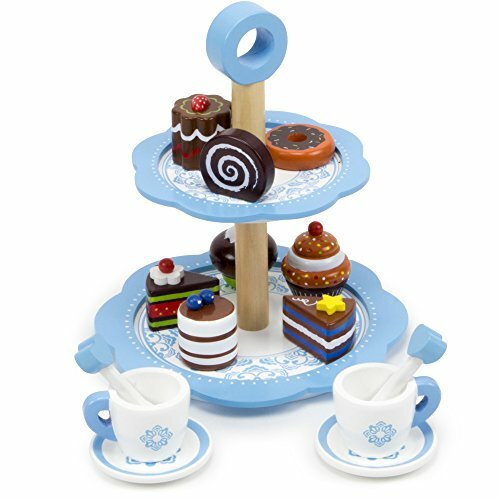 This two-tier tea time and pastry tower will make you wish your daughter had invited you instead of Barbie. The set features a variety of cakes and pastries and two cups, for tea, of course. Saucers and cute spoons are included to complete the experience. The design of the tower is classic and inviting. All of the pieces are made of high-quality wood that’s been painted with water-based paints. For children ages 3 and up, we think preschoolers and beyond would enjoy this with friends, especially the girls. Play food toys are great fun for children of all ages. One of the best things about these toys is that they’re timeless and instill importance around the process of preparing and sharing meals. Make sure you find something that’s made of a durable material such as wood or hard plastic. If we had to choose a favorite, it’s got to be the Learning Resources Farmer’s Market set. It not only teaches young children about colors and healthy eating habits but can also be an opportunity to discuss “buying local” with older kids too. Does your child regularly cook a pretend dinner? Do they show interest in helping you out in the kitchen? Please share a comment below — we’d love to hear your stories.